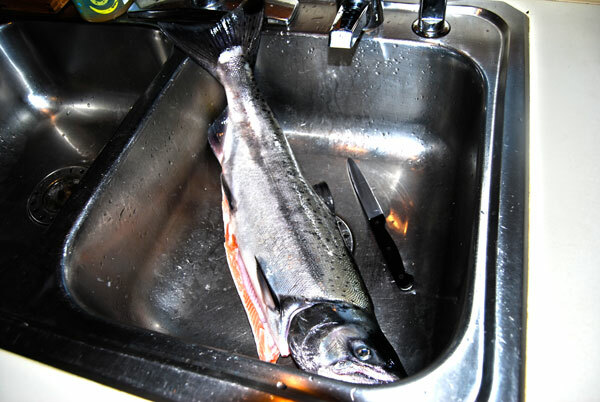 Our neighbor Ron brought over a salmon yesterday he caught on the Klickitat River a couple hours earlier. The fish was about 4.5 pounds (with the head on). I have never grilled fish before and thought BBQ would be the way to go. After a bit of research I found that apparently fish is difficult on the grill due to “sticking” problems and became a little intimidated. I was was about ready to give in and cut the fish into steaks when I recalled that I had an old cookbook called “How to Grill” by Steven Raichlen. There is a fabulous suggestion to cut out a piece of cardboard and wrap it in foil and use that as a platform for the fish. AND the recipe did not insist that you turn the fish over halfway through cooking. Defintely not a weekday meal, but sure is a crowd pleaser. This recipe could very easily be prepped in the morning and kept in the fridge, so would be great for entertaining, and wow, what a great presentation when you open that grill! Clean the fish and remove scales. I removed the head since the fish was too large to fit on the grill. Set grill to medium. Use indirect heat, so in my case, I have two burners, and only lit one side of the grill. If you have three burners, run the two outside ones and put the fish in the middle. If using charcoals you can arrange the hot coals on the outside and put the fish in the middle. 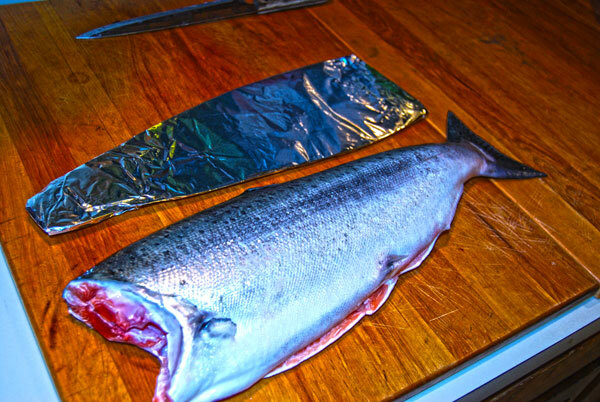 Cut out a piece of cardboard the size of the fish and wrap in several layers of foil. Season the entire fish with salt and pepper, inside and out. Make 4 or 5 deep diagonal cuts in the fish on both sides. Insert lemon slices and basil leaves in the cuts. 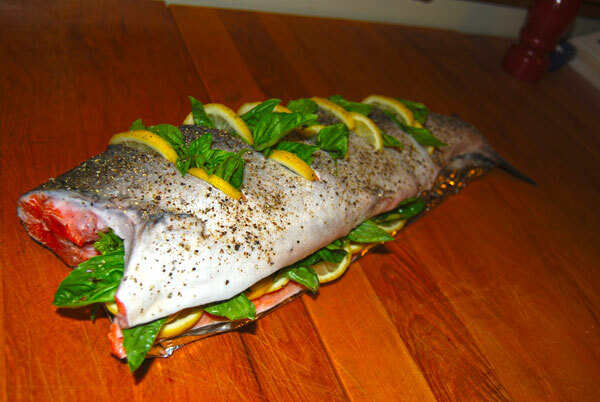 Fill the cavity of the fish with leftover lemon slices and the rest of the basil sprigs. 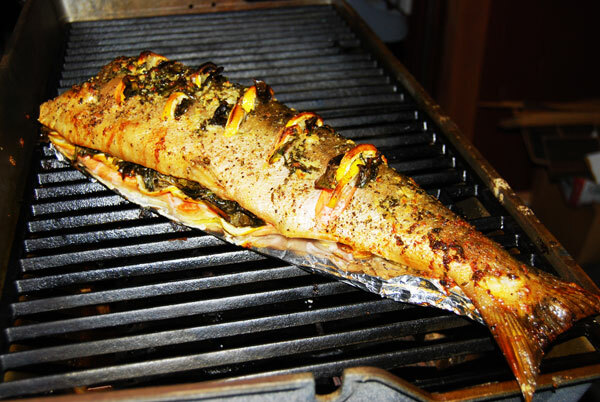 Place the fish on your foil covered platform. Melt the butter and add the Tbsp of minced basil, and garlic. 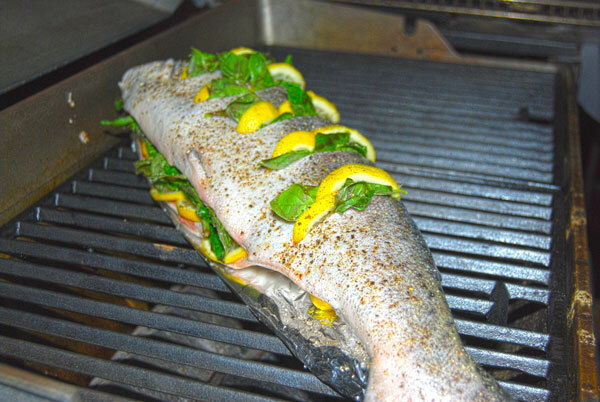 Place fish (and his little platform) on the grill, away from the heat. Baste with butter/garlic mixture. Cover the grill. Cook for 45 minutes to an hour, basting every 10 or 15 minutes. Fish is cooked when you can flake away a piece of flesh on its back with your finger – it will be opaque. Transfer to a platter and let the fish rest for a few minutes before digging in…YUM. Me too! It’s that time of year and the hubs caught two really big ones this time around.